It was completed in 1927 as the auditorium of Hiroshima High School under the old system, which opened in 1924. The number 2587 carved on the entrance floor shows the completion year in the Imperial period. In 1949, Hiroshima University was established, and Hiroshima High School under the old system was comprehensively incorporated and became Minami Branch (Faculty of Liberal Arts). In 1961, Junior and Senior High School attached to the Faculty of Education moved here. The auditorium with Romanesque style is located in front of the main gate. The buttress-like outer wall leading to the second floor, the arched door at the front entrance, the handrail of the cylinder and the staircase is making a texture like stone with shaded ash plaster. It was designated as a bombed building in February 1994 and was registered as a tangible cultural property in 1998. 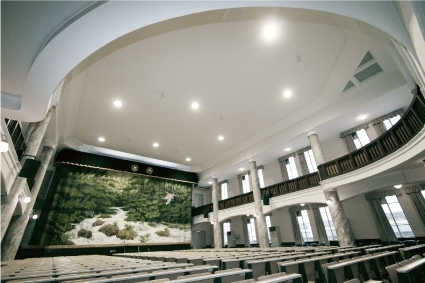 Even now, as a place for school events, this auditorium is loved and used by students.